PlumGirl has been showing a lot of interest in cutting with knives lately. By interest, I mean that whenever she is within reach of a knife that we are cutting with she grabs for and gets very upset when we do not let her have it. Finally, I had the brains enough to think of a cutting activity that she could do. 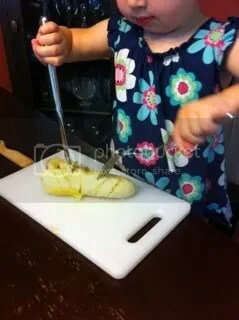 I gave her a small cutting board, a ripe banana, a fork, and a butter knife. 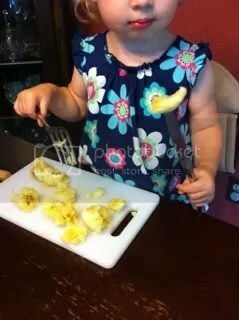 Her technique is not the best, but she did manage to cut the banana. She also ate some of the pieces off the tip of the knife. I know that this is an activity that she will want to do again and again. 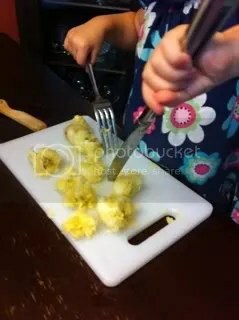 I plan on continuing to demonstrate “proper” technique whenever I am cutting for myself, but to let her experiment however she will when she has the knife.